Clearly some houses at Pompeii are more prone to disaster than others. Not only was dwelling III 5.1, the shop and house of Pascius Hermes, destroyed and covered by volcanic matter just like everything else at Pompeii: it was damaged by a WW II bomb in 1943 as well. Cytaredus cantat Apolo, tibicina n<e>mpe ego. Came<l>opardus abet cor ut Acille<s> ob clarit[atem]. Sum rabid<a>. I<a>m Vulcanus <e>m medicina est. Themis loves the gods. Let Talus win, let him win the musical contest. Apollo the citharode sings. Surely I am a tibicina. The giraffe has a heart like Achilles on account of its distinctiveness. I am furious. Behold now. Volcanus is the cure. Decrying the absence of justice (Themis appears to be preoccupied with her divine friends), the tibicina – a flute-girl, and according to the text itself the author of this little piece – emphatically shouts: ‘let Talus win’ (Talus being her rival in a musical competition, called pantorgana, ‘all-instrument [contest]’, as it would appear), repeating the painful uincat. Talus next appears as the mythological cithara-player Apollo, the divine inventor of the lyre and permanent winner in the lyre-vs-flute contest with Marsyas – increasing the contrast even further by the introduction of a gender distinction between the players of the prestigious cithara and the lowly tibia. The following line – an insult, no doubt – is less clear, except that it combines an impressive, yet distinctively non-brave animal, the giraffe, with the bravest of the Greeks at Troy, Achilles: a pun on the deceptive nature of the tibicina‘s rival? At any rate, her fury persists, and only the destructive forces of Vulcan appear to be good enough to provide a cure. The inscription, seemingly rambling in its unfolding, is far more than a spontaneous outburst of anger. It is poeticising, a so-called commaticum, consisting of lines that closely resemble established rhythmical patterns of well-known verse types, but do not altogether adhere to their required formal standards. It also provides us, however, with an opportunity to have a quick glance at the relevance of music at Pompeii in general and its mentions in the Pompeian inscriptions in particular. 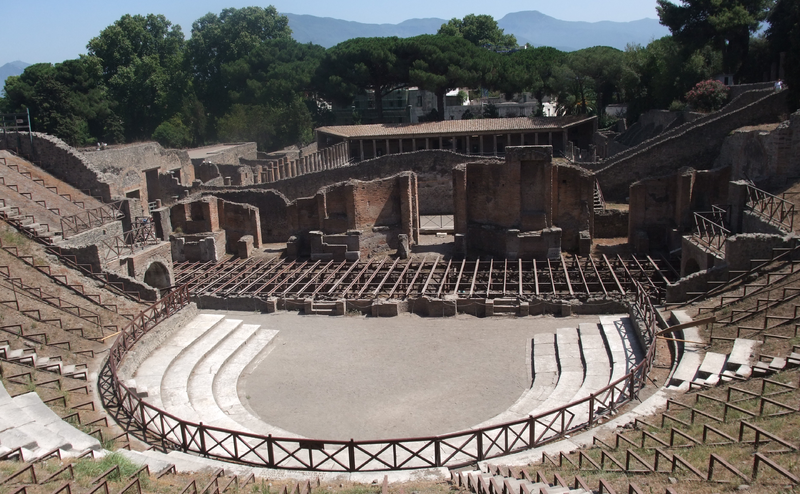 Excavations at Pompeii brought to light not only numerous actual musical instruments: the ruins preserve dedicated buildings for poetic and musical performances – Pompeii’s theatre district with its odeum – as well as well-known visual representations of musical scenes. Moreover, the walls preserved dozens of poems (or quasi-poems, such as the tibicina‘s, above), so-called Carmina Epigraphica, inscriptions in verse. [no]n ob uim uestreis largificatis geneis. [hui]c os incendunt tabificantque animum. Now, unforced, you flood my cheeks. But never can the tears extinguish the flame. These things burn the face and eat away the mind. … than, presumably, a Venus made of flesh and blood, deserving of hymnic praise just like the goddess of love herself…? Several other inscriptions mention the term carmina, ‘songs’, ‘chants’, ‘spells’ – and it is not at all clear in all cases what the writer had in mind (CIL IV 1598. 2361?. 4401. 5304; one may have to add CIL IV 1635, previously read as carminibus credo, ‘I fell for charms’ or some such, which triggered numerous fantastic explanations, all of which are most certainly wrong, as the two words may not even be part of the same text, as the design and possibly even the writing itself go to prove). – a rather amusing remark, considering that the person who writes this both claims not to remember songs, and writes what he (presumably) remembers of a song. With songs (or: spells) Circe bewitched the companions of Odysseus. This is not what happens in Homer, of course, but it gives a vivid impression of the Roman concept of carmen, words put in a quasi-magical order, to unfold their power upon recital – whether poetic, part of witchcraft, or as elements of religious rituals. The tibicina of the first text, above, was angry – rabida, as she says. Is her poeticising text itself then a carmen, jinxing her successful rival Talus, and invoking the devastating powers of Vulcan? It was the power of Vulcan – the power of Pompeii’s neighbourhood volcano Vesuvius (which allegedly was not known to be a volcano by the Pompeians, or so most scholars seem to think) – that unleashed its forces, somewhat rather more drastic than the tibicina may have envisioned. At the same time, rather ironically, it thus preserved a note recording and cursing the success of Talus as well. This entry was posted in Carmina Epigraphica, Epigraphy, Poetry and tagged Carmina Latina Epigraphica, Graffiti, Pompeii, Song Culture. Bookmark the permalink.